Tim has been putting his food creativity to the test and has been coming up with some pretty yummy meals. We kept it basic for breakfast – Cheerios with milk, and juice to drink. 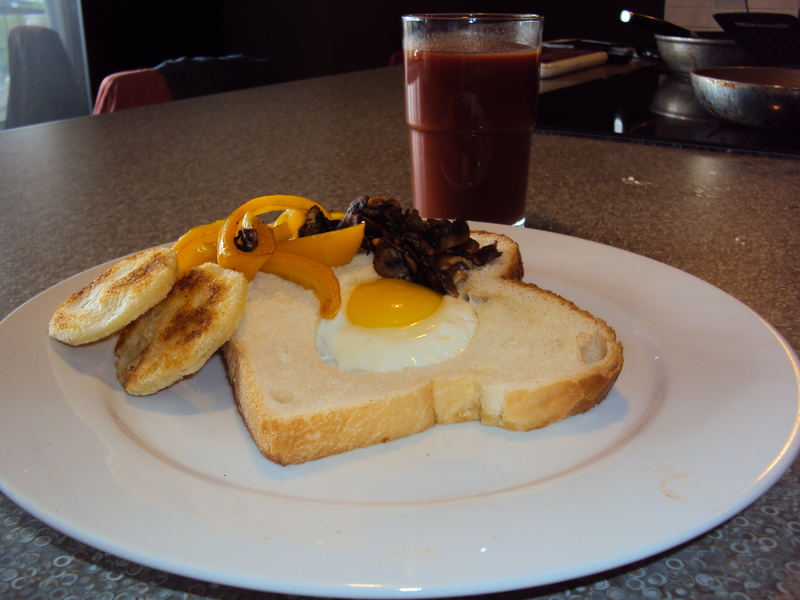 For lunch we had “Crispy Toad in the Hole sandwiches with Sauteed Mushrooms and Peppers“. To make these, we used a quart of mushrooms, which we sauteed in margarine, we melted more margarine in a frying pan and after we took out the centres of the break using a cup, we put the bread into the frying pan and cracked an egg in the middle. The bread toasts up nicely and the eggs cook perfectly. The small circular pieces you see are the centres of the bread, fried up nice and crispy. This is a great meal for kids, because it is so much fun to eat! 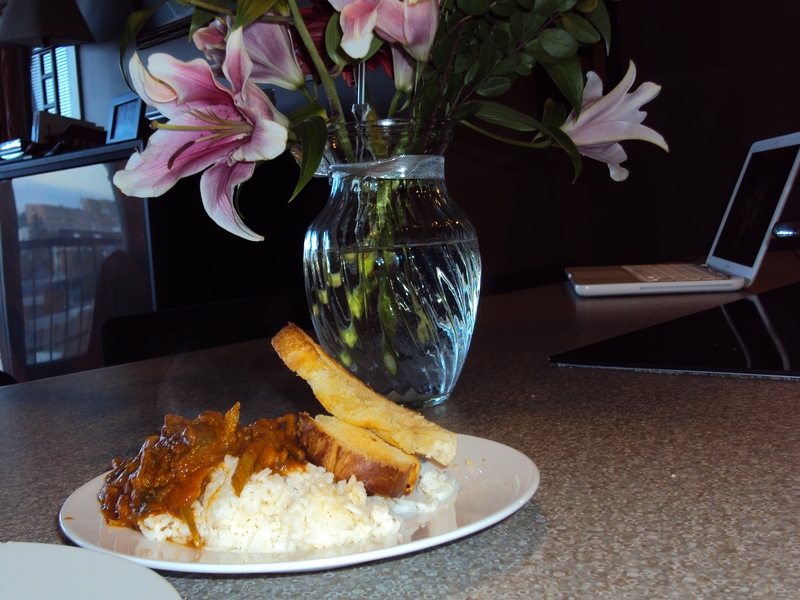 For dinner, Tim concocted up a delicious vegetarian curry. This was so tasty! Full of flavour, and the only “extra” ingredients we used were two of our spices – red pepper flakes and curry powder. Also, there is lots of leftovers for lunches. 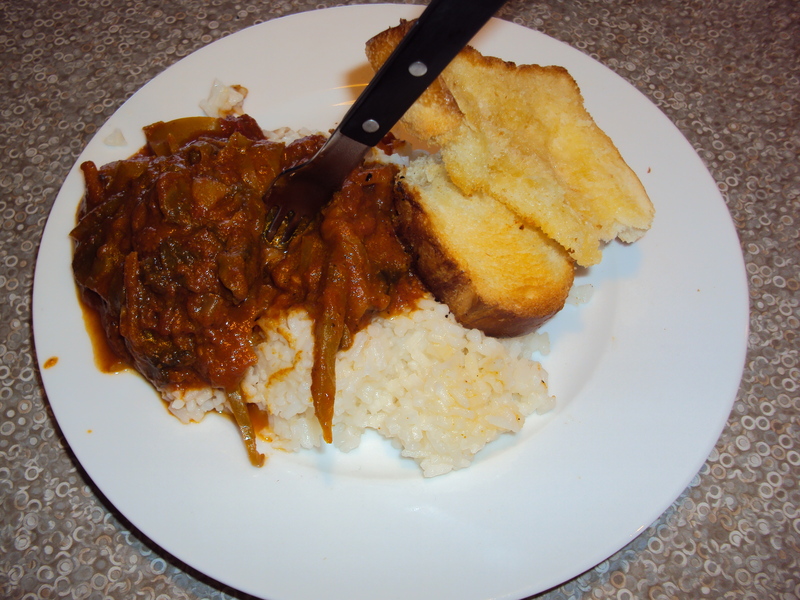 We also toasted bread to go along with it – our version of “naan bread”. Spices: yellow curry powder, hot chili flakes, salt and pepper to taste. The biggest thing to remember when making sauces is to taste as you go and add conservatively to obtain a balance of several ingredients to create one new great flavour. Start by taking a large pot, placed over medium heat on the stove. Add the spices (curry, hot chili flakes) to the pot, stir them around to toast them – this will bring a more full flavour and brightness to the spices. Add 1/2 tbsp of margarine and stir to make a curry paste. Slowly add half of the V8 juice to combine into a smooth consistency. Once the ingredients have reached a sauce-like consistency, add the peppers and mushrooms. Add the coleslaw mix and the can of whole tomatoes. Add remaining V8 juice. Bring to a boil while stirring and place in the oven for 1 1/2 hours at 385 degrees. Stir the ingredients every 1/2 hour. The ingredients should reduce to a smooth, red curry with a thick consistency. If the curry appears too thin, reduce for another 15 minutes in the oven. Bring 2 cups of water and 1/2 tbsp margarine/butter to a boil on high heat in a sauce pan. Remove from heat and add 2 cups of rice, stir and cover for 5 minutes. Plate and enjoy! This was very easy to make and was incredibly flavourful. Entry filed under: Calgary Food Bank, Leah.